Turn on the news, and you will be reminded. These are strange times we are living in. The big story Saturday was a lifetime appointment being granted to a man who cried and shouted, “I like beer!” during what effectively served as his job interview. The “Aug-tober” weather forecast seems far too warm for this time of year. And in sports, Razorback fans celebrated another moral victory despite allowing 65 points to Alabama and never forcing a single punt. The Arkansas football team (1-5) is clearly getting better. Last week against Texas A&M, the Hogs allowed a touchdown to the Aggies in just 12 seconds on the opening kickoff. This week, the Crimson Tide (6-0) had to wait a full 21 seconds before throwing a 76-yard pass to Irv Smith for a score on the first play from scrimmage. If that wasn’t improvement enough, Arkansas forced Bama to run two whole plays for their second TD, another long reception by Smith that was fumbled directly to Henry Ruggs into the end zone. Sarcasm aside, the Razorbacks showed visible signs of improvement Saturday, particularly on offense. Their 31 points were the most Alabama has allowed since the 2016 National Championship game against Clemson. Arkansas gained 22 first downs, compared to 24 by the top-ranked Crimson Tide. Tight end Cheyenne O’Grady, previously rumored to be deep inside Coach Chad Morris’s dog house, caught two touchdowns in the first half. His seven catches led the team. Running back Rakeem Boyd rushed for a Razorback season high 102 yards, which is no small feat against the stout Bama defense. Quarterback Ty Storey was knocked down again and again, but he kept getting back up. Storey threw for a respectable 230 yards and two touchdowns, and only took one sack despite relentless pressure by Tide defenders. Backup QB Cole Kelley added two more touchdowns, one passing and one rushing, in the goal line package designed for him. “I think we are seeing that Morris can run an offense,” said Sean Casey after Kelly’s first TD. Trying to stop Alabama defensively was a completely different story. Crimson Tide quarterback Tua Tagovailoa’s dominant performance seems to be straight out of a video game. The true sophomore has thrown 18 touchdowns so far this season, including four in the first half Saturday. Tua has only thrown 23 incompletions all year. Beginning with the score on the first play, each Alabama touchdown appeared effortless. Our secondary looked like they were running in slow motion while trying to catch Crimson Tide receivers. Linebackers were dragged several yards when they were able to wrap up Bama’s bullish running backs. By day’s end, the Tide had racked up 65 points and a staggering 639 yards, both season highs for the defending champions. Once Bama built a comfortable enough lead, they began replacing their starters with young backups in the second half. The scary realization is that their replacements, such as 6′-5″ 245-pound freshman linebacker Eyabi Anoma, are just as freakishly athletic. Allowing them real game experience will only make them better once it’s their time to play full time. That means the Razorbacks’ losing streak to Alabama, dating back to 2007, may be likely to continue for some time. Since Nick Saban began coaching the evil empire, the results have not changed no matter who is leading the Hogs. Bobby Petrino’s Arkansas teams were outscored by Alabama 146-55 in his four seasons, while Bret Bielema was outpaced by a margin of 183-66 in five years. In his only season as Head Hog, John L. Smith lost 52-0, because John L. Smith. Alabama has become infamous for their “tee shirt fans” who climb upon the Crimson bandwagon when things are going well, but are nowhere to be found during their rare down years. Everyone loves a winner. But following the Hogs like Tusk to Tail requires a different level of commitment. The sting of disappointing losses makes the eventual victories that much sweeter. One day we will find a way to beat these guys, and Lord help us when we finally do. The celebration is going to be one for the ages. Start saving up some bail money now. Nobody had realistically expected Arkansas to upset Alabama this week. Our improvement on offense and special teams, however, was encouraging. 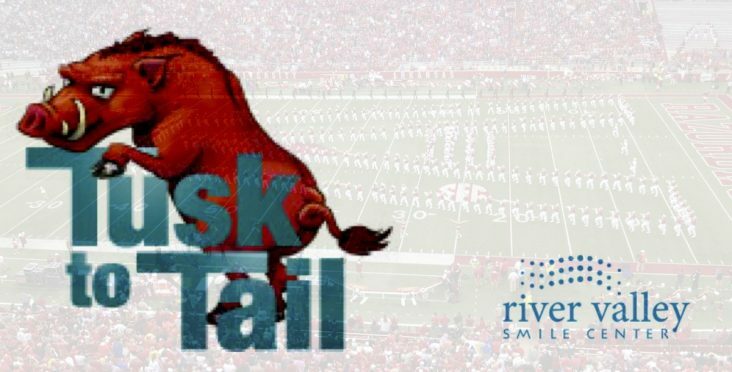 Though few Tusk to Tailgaters actually gamble, covering the 35-point spread in the final seconds elicited cheers and high-fives from those who had returned to the tent to watch the conclusion on TV. At this rate the Hogs may be just a couple of moral victories away from becoming bowl eligible. Of course, the key to further improvement for Arkansas begins with recruiting, and Morris is doing a bang-up job there as well. The Razorbacks were said to be hosting approximately 50 football recruits this weekend, and they earned a verbal commitment from four-star defensive end Dante Walker on Sunday. Walker’s pledge makes him the sixth four-star player to commit to Morris for the incoming class of 2019. Some even speculated that O’Grady’s performance was part of Morris’s recruiting strategy. It is hoped that showing a commitment to throwing to the tight ends may help entice Little Rock Pulaski Academy’s stud Hudson Henry to sign with the Hogs. There is little question these are strange times, particularly for Hog fans. Extra tickets were so plentiful that the coupon for a free Burger King Whopper on the back may have been worth more than admission to the game itself. Less than 50,000 people made the Bataan Death March into Reynolds Razorback Stadium this week. Next week, the Razorbacks head to Little Rock to take on the Ole Miss Black Bear Rebel Sharks at War Memorial Stadium. Amazingly, it will be the first Saturday night SEC matchup there since 1999. TTT’s director of operations Dale Cullins reports that our last all-day tailgate for 2017’s Auburn game went through more than 5 gallons of liquor, 7 cases of beer, 120 waters, 80 soft drinks, and over 7 gallons of lemonade and other cocktail mixers.